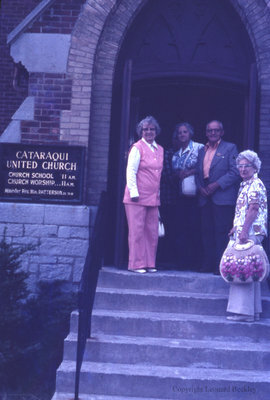 A colour slide of Elizabeth (Betty) Beckley (on the left) with three unidentified people standing on the steps at the entrance to Cataraqui United Church. Cataraqui United Church is located at 965 Sydenham Road Kingston, Ontario. Cataraqui United Church, June 1976, Leonard Beckley. Whitby Archives A2014_004_060.